Rannerdale Knotts is a rather unusual fell, in the form of a long steep sided ridge that ends suddenly in a wall of crags facing north-west towards Crummock Water. This lower fell is a great target for a short walk, with stunning views of the Buttermere scene and north along Crummock Water and the Vale of Lorton, and is a great starting point for a visitor to Buttermere. Technically Rannerdale Knotts is only the name for the western end of the fell, and the main part of it is named Low Bank, but most people call the entire fell Rannerdale Knotts. The valley behind most of the fell is not actually Rannerdale - Rannerdale Beck rises in the cove between Grasmoor and Wandope, flows south-west to the northern end of Rannerdale Knotts then flows north-west into Crummock Water. The valley to the north of the fell is the valley of Squat Beck and Rowantree Beck. There are two routes to the top of Rannerdale Knotts. The shortest runs straight up the western face - from the small car park below the Knotts follow the footpath heading towards Buttermere. At the top of this first climb turn left onto a path that climbs steeping up the western corner of the fell, reaching the ridge just below and to the west of the summit. The second route comes along the top of Low Bank. The start of the path can be reached either by following the footpath alongside Squat Beck or from the Buttermere side, taking paths either from Crag Houses or the National Trust Car Park. We currently have no walks on Rannerdale Knotts. The summit is a mix of rock and grass at the western end of the long ridge. The highest point is obvious, with a distinct higher area just before the end of the ridge. The views of Crummock Water are splendid, but the highlight is probably the view back across Buttermere. The eastern and southern borders of the fell are marked by Mill Beck, which runs down from Newlands Hause into Crummock Water. 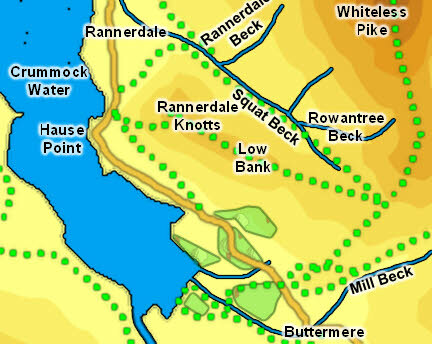 The northern border is marked by Squat Beck then Rannerdale Beck. The western border is marked by Crummock Water. Rannerdale Knotts has no tarns. The most famous feature of Rannerdale are its bluebells, which bloom in an open field at the northern foot of the knotts. These attract large numbers of visitors, and care is needed to avoid crushing the delicate flowers.